Because of big, happy grins. Because of a sweet little nose. Because she is obsessed with doughnuts. Because she is a worthy human. Because we are better with her. Because she has a place in your class, in your school, in your community. Because the world needs love like hers. Because OH MY GOSH THIS SWEET VOICE! Because of all the little pieces of her that rock. 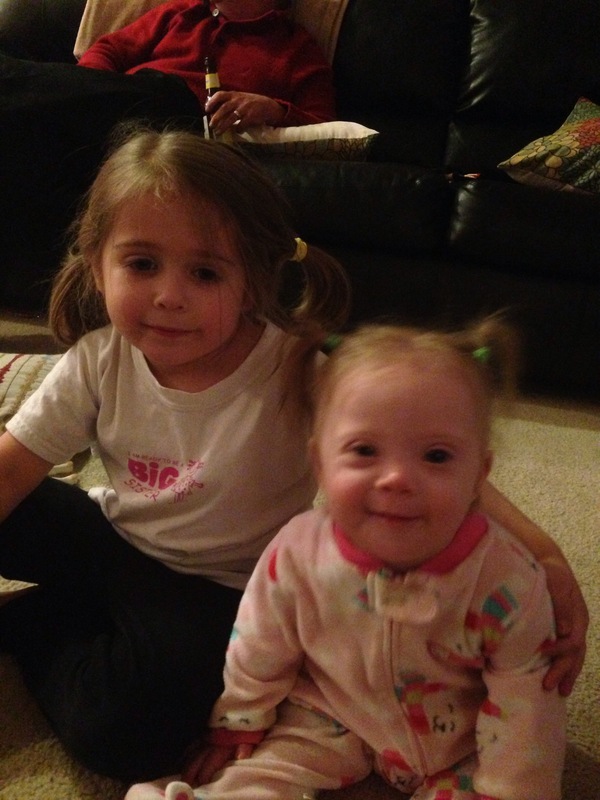 Happy World Down Syndrome Day. We are so thankful that she is ours. I never tire of the holidays. I have no max input of twinkly lights. Buying presents does not exhaust me. I could wrap for days and days. I love the endless onslaught of Christmas cookies. I have no fear of the rush to move from house to house, visiting with family and friends, enjoying coziness and cheer and gingerbread house making and ALL OF THE HOLIDAY THINGS. I am sure that much of my love of this season stems from the fact that I have two love languages: gifts and quality time. The American Christmas Season was made for people like me. I mean seriously – all we do from Thanksgiving through New Years Day is what I love – buy things and love on each other through endless holiday gatherings. Sometimes where I falter is in reminding myself that the American Christmas Season was not made for all of the people I love. For example, about a week ago, my parents took me and the rest of the ladies in the family to an afternoon performance of The Nutcracker. I imagined a magical afternoon with my girls, their faces lit up with unbridled excitement at the costumes and the music and the dancing. As the performance drew nearer though, I began to have some trepidation of how Tessa would respond to the theater environment. In general she has struggled in concerts, performances, and other events where there is clapping and lots of sensory input. In the name of including her, we forged ahead with the day, and I was hell-bent on making this a great experience. Before the curtain even went up, it was apparent that she was going to sob her way through the performance (I suspect in fear of the moment that applause would break out). It didn’t matter if I covered her ears or found some other way to block out the noise, she was not going to have it and my magical day with the girls suddenly felt heavy and sad. I’ll be totally honest – when I ran out of the auditorium and into the bathroom with her, I cried in anger for about 15 seconds because this beautiful experience was so hard for her. It felt really unfair. And then, as I sat with her in the lobby and waited for John to take her home so that I could watch the show with Ellie, I thought through all of the hard things that people deal with in the holidays. I gave myself an internal stern talking-to and reminded myself to calm the **** down. Because seriously, this is a molehill compared to the hurt that people struggle through during what should be a sweet and festive time. My struggle with perfection has come to head this season as I have seen my eldest start to navigate the very real irritation that I also feel when things do not go as planned. She is as I am. And to help her function in our world, I have to consciously choose peace in the imperfect, not in perfection. It is not easy. I have wanted desperately to rearrange ornaments, or people’s choices in meal times, or my child’s psychological brain function…. it’s not realistic. Well, that was a little awkward, wasn’t it? Truth be told, my family is a chaotic mess when we shop together. We do it often, hoping it will get better as we practice. So far, we haven’t much improved, but we keep charging through it anyway. You had it together much more that we did, pushing your two little girls through the aisles. We are a tornado… so it’s no wonder that your daughter noticed mine. They may not look it, but they are probably the same age. I couldn’t look up at you at the moment. I just grabbed my lunch meat and Kraft singles and hightailed it out of there, shouting to my husband to choose a Pinot Grigio and not a Chardonnay. If you’re anything like me, you’re probably still thinking about today just a little bit, wondering if you handled our interaction well. You might be thinking about your little girl, like I am mine, and hoping that you helped her see the beauty in what is different. I wanted to thank you, to tell you that I appreciated that you didn’t scold your daughter for her statement. She’s so young, and curious. 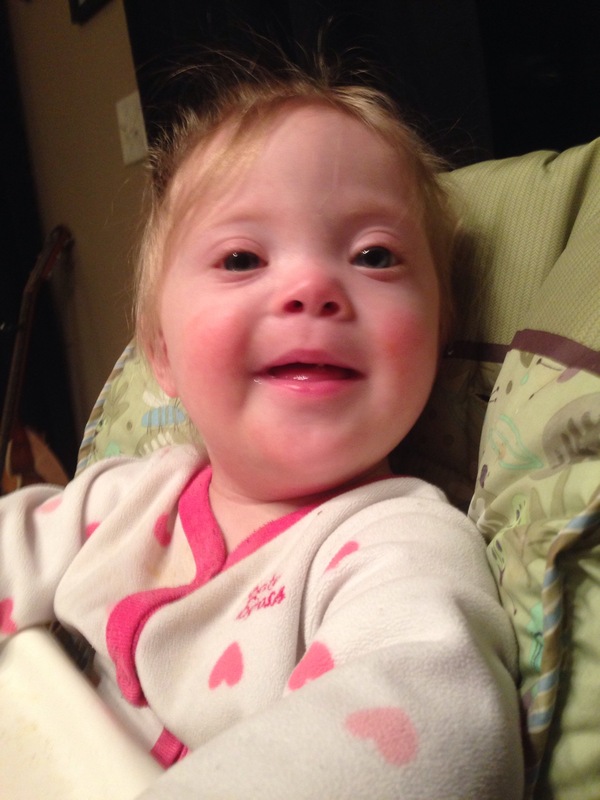 If I had been less frantic, and more brave, I would have smiled back and told her that Tessa looks a little different because she has Down syndrome. And I would have told her that even though she looks different, she loves Moana and pink and Goldfish crackers, just like I bet she does. 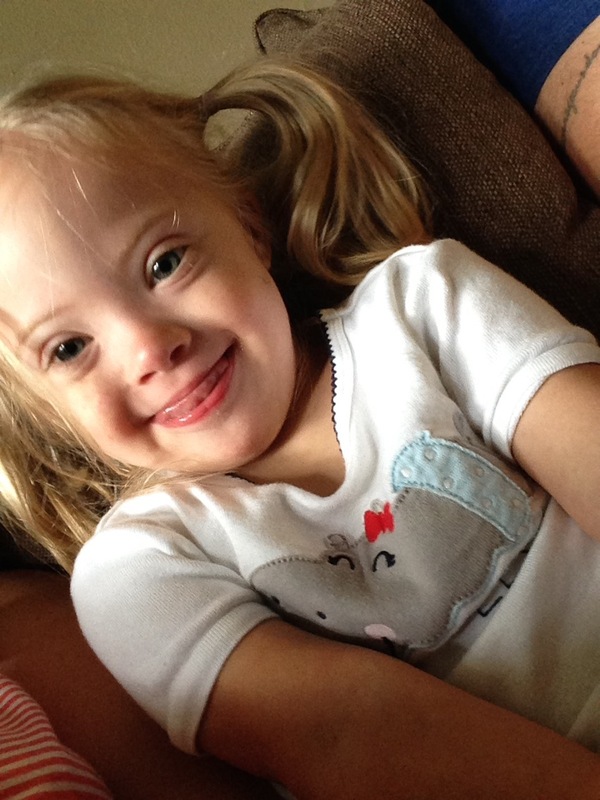 I want you to know that it is OK for you to use the words “Down syndrome” to explain one of the things that makes our girl unique. 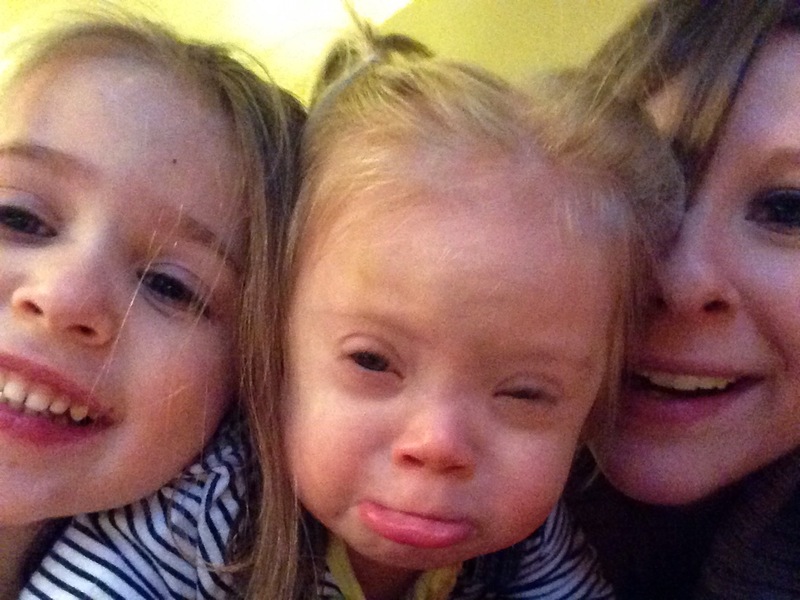 We don’t whisper those words in our house; Down syndrome doesn’t hurt our feelings. And while it does not define who Tessa is, it certainly does help our little ones understand why she is a little bit different. I’m sure we will cross paths again. Our community is not large and Aldi is a pretty tiny little store. When we do, I will be brave and thank you in person. I hope you know how happy it made me to hear someone speak so sweetly about my daughter. Not everyone sees what we see, and I thank you for that. You’re doing a great job. Two is such a sweet little word. Two. Just say it out loud. Come on, do it. Seriously. And so, now she is two and we are smiling. This isn’t an entry about a path to acceptance or how far we have come. It’s not meant to tell you all the wonderful things that she has accomplished this year. I don’t feel like celebrating all the hard work and the progress, I just want to celebrate her and who she is and what she means to our family. 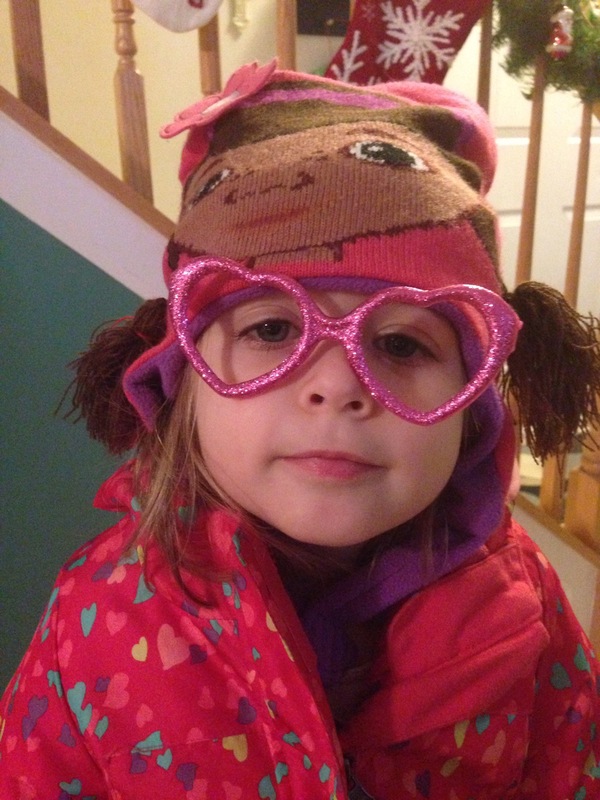 At two, she’s fun and feisty. She loves to say hello to strangers in the store. She throws her arms out when she wants to be held and is crazy persistent with her demands. Her favorite food is vanilla Oreos, which she daintily holds between thumb and index finger and slowly nibbles away at each night after dinner. One cookie is never enough. She doesn’t much feel like walking. Crawling suits her well enough for now. She has a great stink-eye when she’s not into whatever you are requesting that she do. The therapists get it often. So do I. Her enthusiastic “Hiiieeeeeeeee” when I walk in the door makes me grin every time. She’s upset by laughter still, but calmed by big hugs. She loves to read books and make animal sounds. She gets angry at bedtime. Bright and early in the morning, she pops up and chatters Ellie’s ear off until she gets a response. She sings. It is the sweetest little sound. She’s been worth every stretch mark and extra pound that I haven’t lost. Every chaotic mealtime with two small children instead of just one. Every frantic dash to clean up before therapy. She’s worth all of the everything. 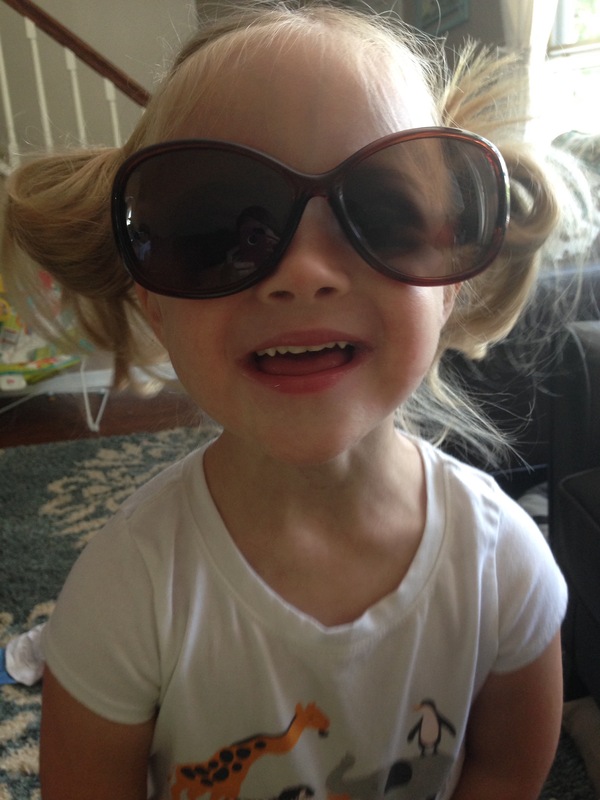 And really, all of the everything is nothing compared to our love for her and our gratefulness to be raising her. Two has come quickly. The other years, I am sure, will be no different. I am just so thankful to have her to say hi! when I walk in the door, to give hugs in the morning, to steal hearts and change minds and to teach her sister (and maybe some others) a little something about kindness and sharing and love. To sit and watch babies lose their Early Intervention therapies left and right is gutwrenchingly painful. I cannot understand what our state has come to. I cannot understand a world in which we cast aside those who need us the most, to be nothing but a political pawn in a game of war that we can only lose. This is not a liberal or conservative issue. It is about human rights. 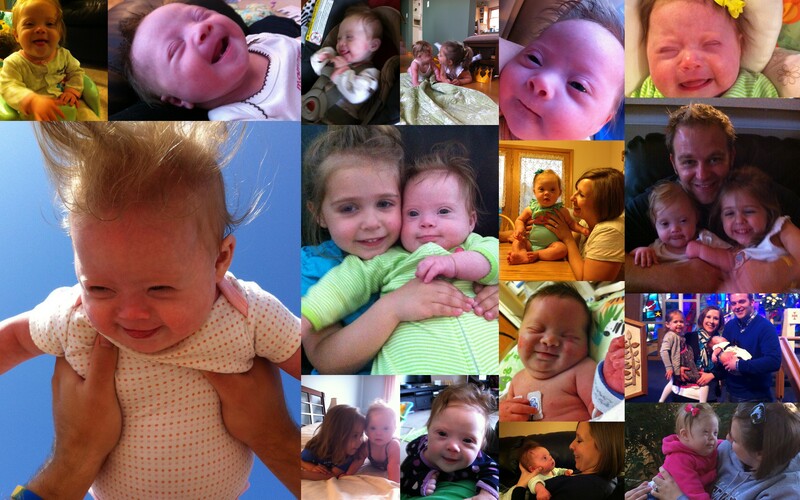 I am well aware that a somewhat vocal minority believe that it has been my choice to have a child with special needs. You could have aborted her, they say. (Yes, they literally say that) And then there would be no expense for therapy. There would be no expense, no argument for Early Intervention. She’s just an expense. Not a human being. There are people who cast us aside and feel that we are owed nothing because we can contribute nothing. We are owed nothing. I understand this. But we contribute. What world do we live in that civilized human beings will shun needy children? What world do we live in that politicians continue to push down on the disabled and the hurt and the suffering and play with the very real power that they have to devastate an entire population? What is going on with a world where not getting a lottery payout is national news, but thousands of children being abandoned is not even covered somewhere on page 12?? Family and friends shake their heads from afar… Oh, that’s a pity they say. I’m so sorry to hear this, those (fill in derogatory term) politicians… They get mad, and move on in their day…. We cannot. We live waiting for the letter that terminates services. We watch our dear friends lose their lifelines. And it hurts us to know that we are alone in this battle. Don’t tell me that this is just temporary or that it’s just a publicity stunt. Don’t tell me that money has to be cut somewhere, so just deal with it. WE ARE TALKING ABOUT BABIES HERE. Babies. We are talking about babies. Anyone who thinks that people with Down syndrome are eternally happy should come spend some time with us from 6:45-7:15 on any given night. The phrase “scream like a banshee” has taken on a whole new meaning since our sweet little booger has decided that bedtime simply isn’t her thing. With every wail, I can hear her cursing us for leaving her in the dark. The best part is that her timing is unsettlingly perfect – just as you breathe that sigh of relief because finally, she’s calm and reach to take a sip of your wine, BAM. Just kidding! If she had words, I can guarantee she’d be yelling the ones you wouldn’t say in front of Granny. I can’t say that I blame her for being upset. When you live as thrilling a life as we do, it must be devastating to miss out on the fun. Between the crossword puzzles and episodes of House Hunters that have been on the DVR for about 2 years, I sure wouldn’t want to sleep through any of the awesomeness. We’re just bustin’ down stereotypes, one bedtime routine at a time. I swear to you, Tessa comprehends every single thing I say to her therapists. Just as soon as I tell them that she is struggling with anything, she masters the skill and I end up looking a little silly. Tuesday, our PT and her supervisor came for her weekly session and I had an extensive list for them. I expressed that I was still concerned about her refusal to use her left hand. I shared that she was sort of sitting, and sort of getting into her sitting position from laying down, but that she would not lift her left hand. As of Friday, we have a sitter. And she’s a sitter who can get herself into a sitting position all by herself. And while she is there, she can play with toys! I also vented a little about how I have to change the way I laugh because every time I laugh loudly (which is often), she cries. She doesn’t cry when anyone else laughs and I’ve been starting to get more than a little dismayed at being the sole cause of my child’s tears. Since Tuesday, we have not had even one meltdown. And, the icing on the cake is that our Little Miss started clapping yesterday. I didn’t even complain about that one yet! 😉 It’s very quiet and sporadic, but it is really happening. I wonder if I start complaining that she can’t change her own diapers, will she pick that up right away?? Three times I’ve written this and three times, it has been deleted. Ladies and gentlemen, I am 100% stuck in a rut. Miss Cranky Pants? Oh yeah, that’s me. My hope is that just throwing this out there will somehow help me to snap out of it. 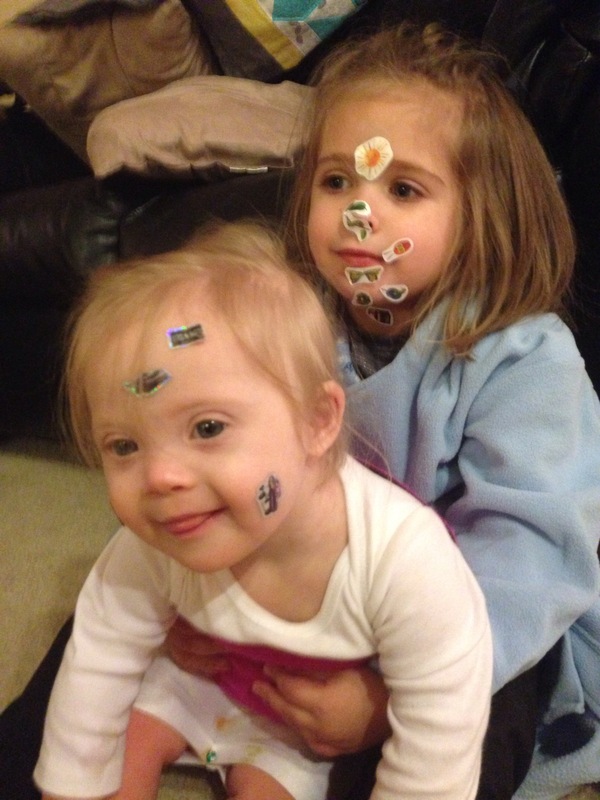 I have been told many times that my feelings about developmental delays will ebb and flow… It’s so true. I don’t know if this crabby phase is an “ebb” or a “flow”, but it’s where I am right now. This all began (kind of) with the planning of Tessa’s first birthday party, which is in a month. I’m thinking a lot about the milestones that are commonly associated with the first year – walking, using a cup, eating table food, first words – and thinking about how hard she is working and how far away these milestones seem to be. She will do them all in her own time. Today, I just wish that one thing would be easy for her. Just one. I think a lot of this was magnified by the Thanksgiving holiday and time to catch up with family and friends. I found myself talking a lot about what we are working on in therapy and how she is doing. I have an idea in my brain that people have expectations for what an almost-one-year-old should be like. And somehow, I have convinced myself that if people see her and she isn’t that way, the way they are expecting, then they will feel bad for us. Pity is the absolute last thing I want. She’s so little! Someday, she’ll have her own personality and talents. They are already locked in her little brain somewhere. 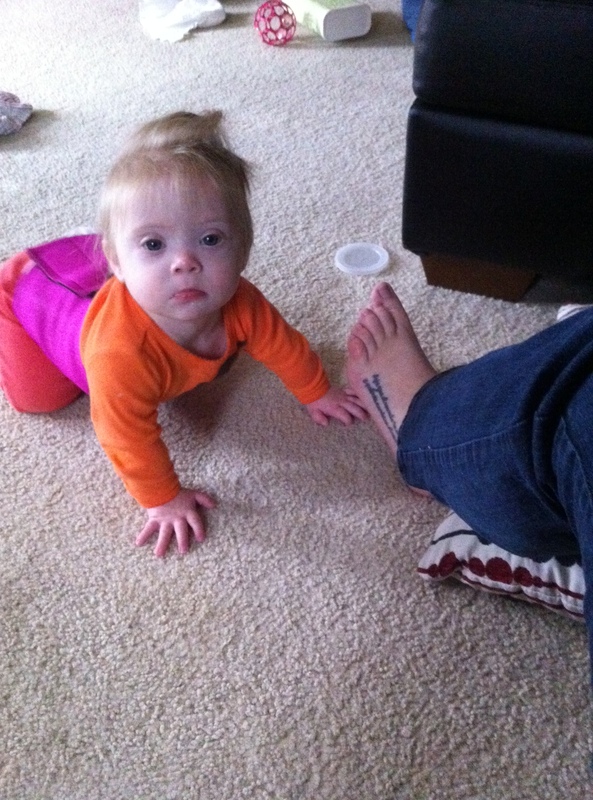 Because of Down syndrome, the puzzle is a little trickier to figure out, but her strengths will emerge. Rather than frustration, what I really want to feel is cheers for how hard she has worked and how far she has come. She’s army-crawling. She’s holding her own bottle. She’s mostly sitting. She’s babbling like crazy. It’s progress. In all of this, I would change nothing. Just as I would not change any of the aspects of myself that I struggle with, neither would I in her. All of this serves a purpose. 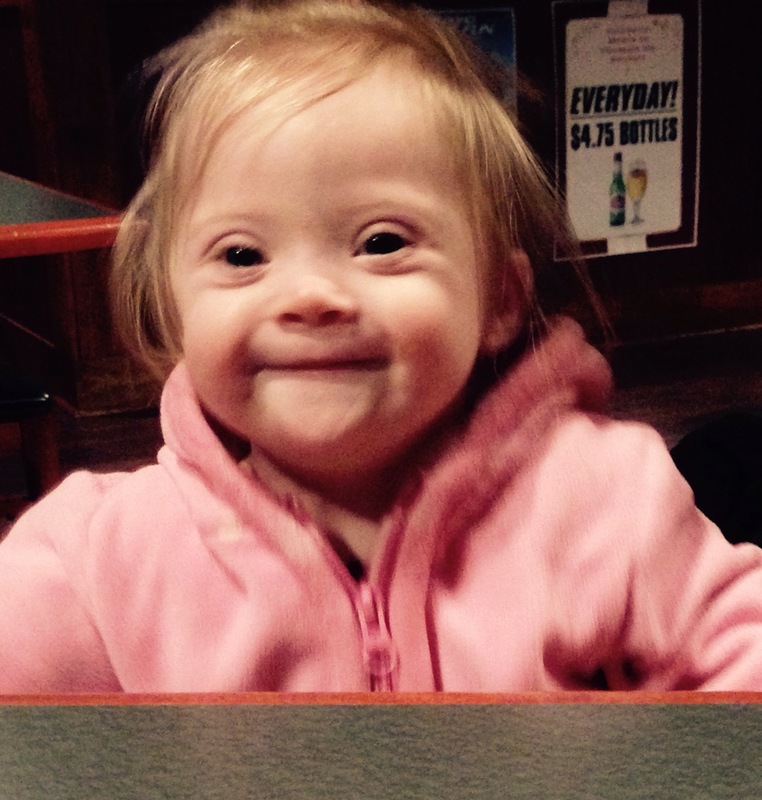 All of the ebbs and flows and smiles and tears and everything else that comes along with an extra chromosome is part of her role in this crazy world. She and all of us are better for it. There. I’ve said it. I’m in a funk. But I’m feeling better already. I’ll be honest with you – along with those ridiculous stick-figure families on the back window of 80% of family vehicles, I loathe monthly baby Facebook updates. You know what I’m talking about? Little number tacked onto a onesie, baby sitting next to some board that lists all the stats… Loves peaches!! Great eater!! Hates going to sleep!! Started doing quantum physics!! Really, I don’t think I’ve given you a monthly update in quite some time. I forget, most days, how old Tessa is. The number floats around in the back of my brain and if asked, I can retrieve it. With strangers, sometimes I lie and tell them that she is younger… usually, that’s just easier than having to explain that yes, I know she’s a tiny little peanut and no, she’s not walking yet. But even if the rest of the world is obsessed with how she measures up to her peers, my thoughts about her have so little to do with what she should be doing and so much to do with how far she has come. I don’t really think much about ‘man, you should be standing!’ There are mostly thoughts about how therapy is helping and how much I want to do what is the very best for this girl. This is the last post of the 31 for 21 Blog Challenge! This is my most important lesson. Upon returning from my summer Study Abroad program in Ecuador during college, I did something completely uncharacteristic of me: I got a tattoo. Evidence. And, a new ab binder. Never has this been more relevant to me than it is now. When I think back to my old high school yearbooks, I remember a lot of the signatures urging “stay sweet!” or “don’t change.” Um. Thank God I am not the person that I was when I was 17. Seriously. With time comes perspective and if I could re-sign all of those yearbooks now, from the eyes of my almost-thirty-year-old-self, my message would be quite different…. Don’t harden your heart when you experience struggles. Grow. Learn. Experience. Listen to the stories of others. Open your heart to what they are telling you. Seek to understand, to support, to love. Be compassionate, caring, empathetic, kind. Take what they have to show you and make a difference. That is all we can do to leave this world a better place than how we found it. When I think about little Miss Tessa and her place in this world, my prayer is that others will seek to understand when they interact with her. 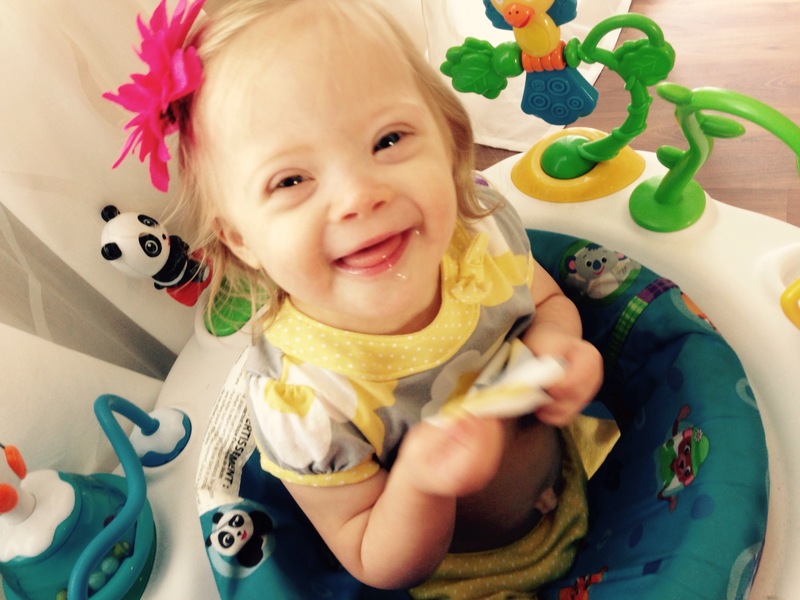 She doesn’t have to perform any great miracles or bust through any stereotypes. But maybe, just maybe, she will teach someone how to love. Maybe someone will connect with her in a way that will open their heart to more patience or acceptance. Maybe her smile will make a difference on a bitter day. Maybe including her in a classroom of typical children will be a greater lesson for her peers than can be found in any textbook. Maybe cheering on her successes will create advocates in unexpected places. When we allow the experiences of others become a part of our hearts, we can change the world. Will you let her change you?